I am fully prepared for you all to think I’m a bit odd to have never had a proper bowl of stove top oatmeal until now. Odd or not, it’s true. Oatmeal was never on my radar even at all until the last year or so when I tested out some instant oatmeal with varying results. Some were edible, others were atrocious. Either way, I wasn’t jumping up and down clamoring for more. 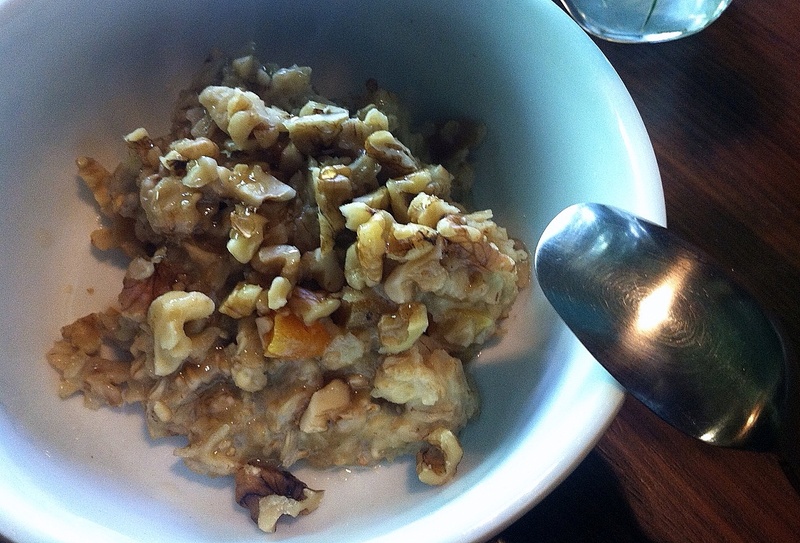 On two or three occasions in the last year, though, I did try ordering oatmeal at restaurants. These experiences were better and opened my mind up to the idea that oatmeal may not be such a bad thing. Okay, let me back up, I mostly ordered it when it was called porridge. Because calling it porridge appealed to the total anglophile in me. Anyway, there was hope on the horizon for this warm cereal-like concoction to actually be worth trying. But I still wasn’t ready to invest in making it at home. A couple of things stood in my way. First: granola. A formidable foe for oatmeal, because I LOVE granola. I could (and often do) eat granola every damn day. Second, I was totally intimidated. Given the facts that instant oatmeal was generally awful, restaurant oatmeal was (at best) kind of nice, and I had never seen anyone actually make oatmeal on the stove top before, it seemed like it must be really, really difficult. I imagined it being super-finicky, needing to keep the heat level just perfect, the amount of liquid measured with ultra-precision, and timing it just magically to prevent mush. (Sort of like the breakfast version of risotto, which is actually kind of funny because I love making risotto and have never found it difficult at all.) I just couldn’t figure out how it would be worth it to go through all of that for a bowl of oatmeal when there was granola-a-plenty in my pantry. Then came my gluten-free dietary change. Now, many gluten-sensitive people can’t eat oats, either, but I don’t seem to be one of them. As long as I buy gluten-free oats, I seem to be okay and I didn’t react to them when my blood was tested, either. With many of my go-to food options out the window, I need to learn some new tricks. This is what prompted me to take on homemade stove top oatmeal. Sorry for all that yelling. I just am really excited about this. 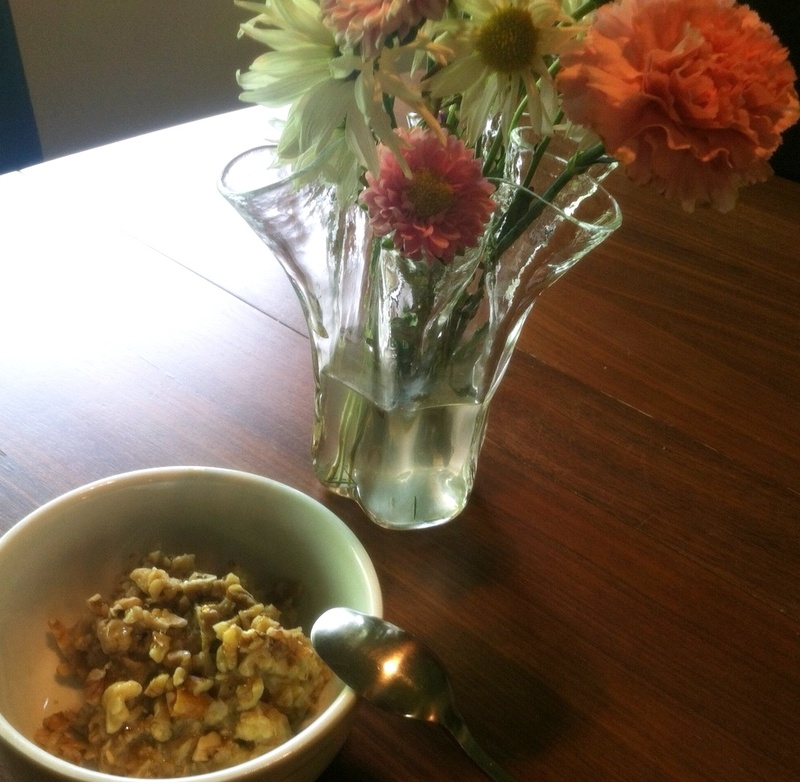 Homemade stove top oatmeal is AMAZING! Frankly, I don’t really understand why no one has told me about this before. Are there huge numbers of us out there who don’t realize how delicious and easy this meal is?? Or, do those that know keep it a secret so they never have to worry about having to share?? I’m just so shocked it took me until 32 years of age to discover this one. I have Project Grown-Up to thank for providing me the basic instructional information on how to make this oatmeal. I used this post here as a guide and proceeded to make oatmeal three times in four days because it was so good – each and every time. It may come as no surprise to you that I absolutely love how versatile it is. The flavor combinations are virtually limitless and allow me to suit my every whim. It’s also quick, totally easy to make, and provides such a warm, comforting, healthful way to start my day (or end it, as I did eat this for dinner one night). They have been amazing and I just want to eat oatmeal all the time. All. The. Time. As dull as this topic may have seemed before starting it, this might be my favorite Foodie Firsts yet. Plus, there are so many avenues with which to take this. I keep seeing recipes for baked oatmeal. I can only imagine how delicious that will be! Serving Suggestions: While you can certainly go with just a bowl of old fashioned oats or just a bowl of steel cut oats, I have found I like a blend of the two. I use about 2 or 2 ½ parts old fashioned to 1 part steel cut, but I find the little bit of texture variation between the two is quite nice. Play with contrast in other ways, too. 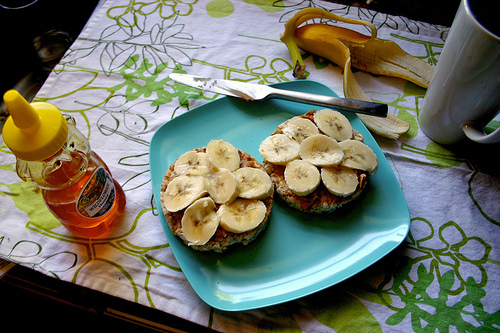 Top your warm oatmeal with some slices of cool apple. Cook in some dried fruit to soften it up, but don’t add your nuts until after the oatmeal is done cooking, providing a nice crunch in each bite. Finally, make sure you salt your oatmeal. This is CRUCIAL to flavor. CRUCIAL, I say! Lessons Learned: This challenge totally taught me to be willing to put aside my pre-conceived notions about common foods. 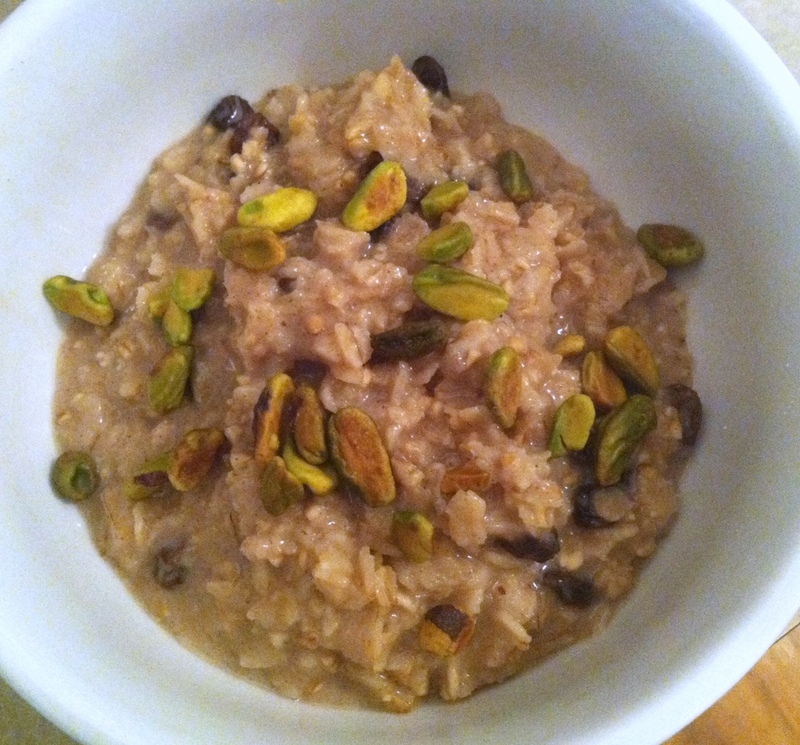 I THOUGHT I knew what oatmeal was (bland, mushy, sticky) and I was TOTALLY wrong. It’s good to be humbled sometimes in this way and be willing to allow myself to be wrong in order to discover something wonderful. I had a whole Foodie First column planned for today. I also had a post about creativity and confidence planned for earlier this week. Neither has happened as planned and I want to explain why. Life threw me a curveball this week. A super curvy-curveball that I’ve been fumbling around trying to manage (yes, I did just mix those sports metaphors). For the past couple of years, I have experienced a variety of health problems that, while not dire or life-threatening, have been persistent, problematic, and caused quite a bit of pain and discomfort. I’ve gone through a series of frustrating tests and medical consultations without any answers or much concern given by the professionals I’ve seen. I sought out a new doctor recently (a doctor of Naturopathic medicine) and am starting to get some answers. They just weren’t the ones I was expecting. I thought I had a pretty good idea of what might be the culprit and she agreed it was very possible. In this vain, we decided to do some more tests and she also offered up another possibility that no one else had suggested in my medical visits: a food reactivity test. I agreed, thinking it would be interesting and potentially helpful, but I didn’t really think it would be quite the game changer that it was. The results came back on Saturday and they were pretty startling. 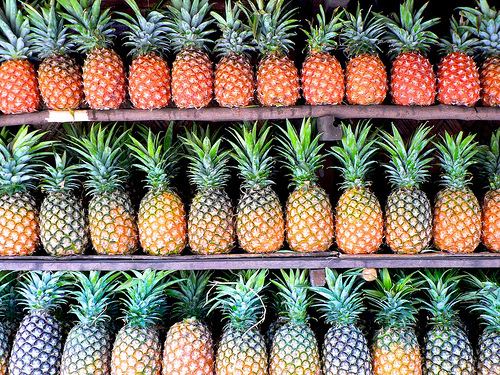 In a nutshell, I have been eating foods that my particular body is unable to handle properly, likely resulting in significant inflammation and a wide variety of painful and uncomfortable symptoms. There are basically two categories that popped up that I have classified as: The Super Big Bads that I will likely have to remove from my diet pretty much forever, and the Maybe-Possibly Big Bads that are causing reactions for sure (so they are off the table for a month or so) but may be able to be eaten occasionally once I’ve had a chance to get the current inflammatory damage under control. It’s a grim list. It’s very, very grim. An example of how grim? Followed later by a mid-morning snack of a banana. The rest of my day follows suit. Since getting this information, I’ve been a bit of a mess. I’ve had lots of emotions and am basically going through the stages of grief. To some, this may sound over the top, but to me, it’s not. As I’ve talked about on this blog, my love of healthy eating, cooking, and baking was only discovered in the last couple of years. 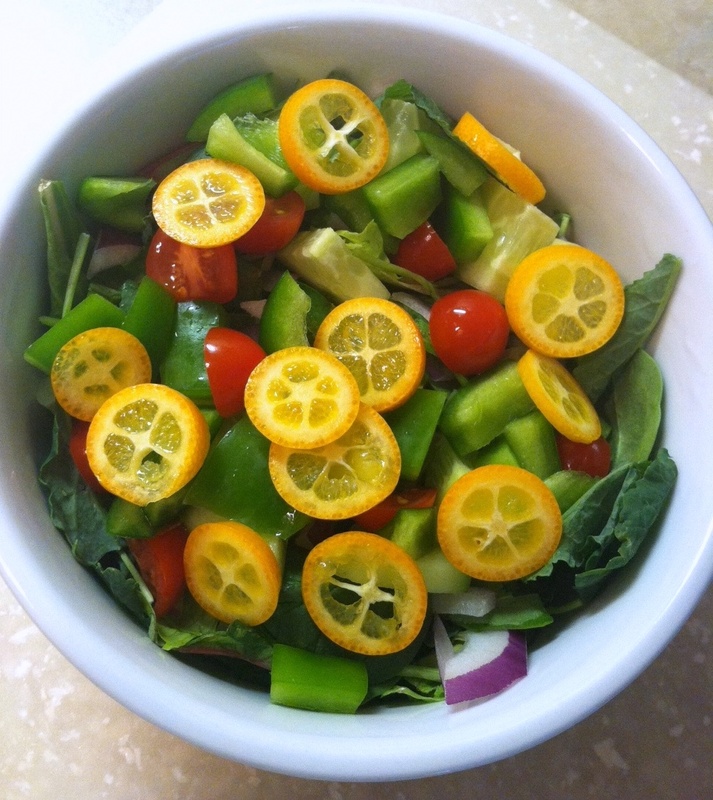 I’ve fallen in love with whole, real foods and finding new ways to prepare them. I’ve discovered things I had never eaten before and was looking forward to eating lots more of. Things like spelt muffins and scones (my absolute favorite flour to bake with these days), whole wheat grainy breads and cookies, almonds in just about every way you can imagine (almond butter, almond/fruit snack bars in the afternoons, almond flour, almonds in desserts, almond milk, almond yogurt), hummingbird cake with pineapples, and bananas eaten raw, used as sweetener in baked goods, and combined with dark chocolate. Now these things are off limits and I don’t really know what to do. Yes, it’s an opportunity to try more new things and yes, it’s a chance to get even more creative with my cooking, but right now I just want a slice of healthy, grainy toast with almond butter and a good, strong cup of coffee. I don’t really think that’s too much to ask. So my last few days have been spent purging my pantry and kitchen, carefully reading ingredient labels, spending hours (and lots of money) at the markets, and just figuring out what is safe and what is not. Hence, the lack of blogging this week. 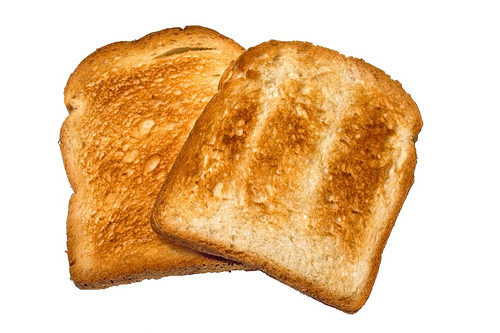 Do you have any idea how many foods contain gluten, yeast, and/or almonds? Forget about the fact that cane sugar is on the list – it’s in nearly everything. I realize that was a long explanation for my absence and I could have just said ‘sorry’ for dropping the ball this week, but I wanted to share some information about what’s going in. I’ll be back next week with regular posts and I’ve no doubt that this new part of my life will be included, as it will surely impact those topics that near and dear to me here on this blog: healthy living, running, cooking, and overall brain and body wellness. Also, in my absence this week, I failed to post that Monday marked my one-year anniversary with this blog. I was sorry to have missed honoring that day and saying thank you to everyone who has stopped by, tried a recipe, took a running tip, left their own advice and input, and generally joined me in my little space on the Internet. You all are fantastic and I have loved putting Move Eat Create together over this past year. I have a lot more planned for year two! You know how people often say they have a love/hate relationship with something? How they lament about being torn between the benefits and satisfaction of something and the pain or challenges that very thing may cause them? You know that, right? Well, I have had a hate/hate relationship with mushrooms for as long as I can remember. There’s been no love. None. To be fair, I haven’t eaten a lot of mushrooms in my life, but, really, it didn’t take me long to develop a belief they were the worst food ever. They were slimy. Or mealy. Or slimy AND mealy. They were overcooked or undercooked. They tasted sort of like dirt and they took up large portions of ingredient real estate that could have been used for other, less offensive items. I guess this is the post where I tell you how I REALLY feel. Here’s the catch, though, I know how good they are for me. I know that they bring an incredible amount of nutrition to any meal and I’m on board with that. After I read Super Immunity by Joel Fuhrman (LOVE this book, by the way), I was convinced I needed to figure out a way to start over with mushrooms. Fuhrman is a big fan of what mushrooms can do for our health and I’m a big of Furhman, so I decided that we needed to make amends, mushrooms and I. I thought maybe it was time I give them another chance. It was going to be tricky, as I was still holding a bit of a grudge against them. But, here’s where my Foodie Firsts column came in to play. I had NEVER cooked with mushrooms and I had NEVER eaten a mushroom I liked. 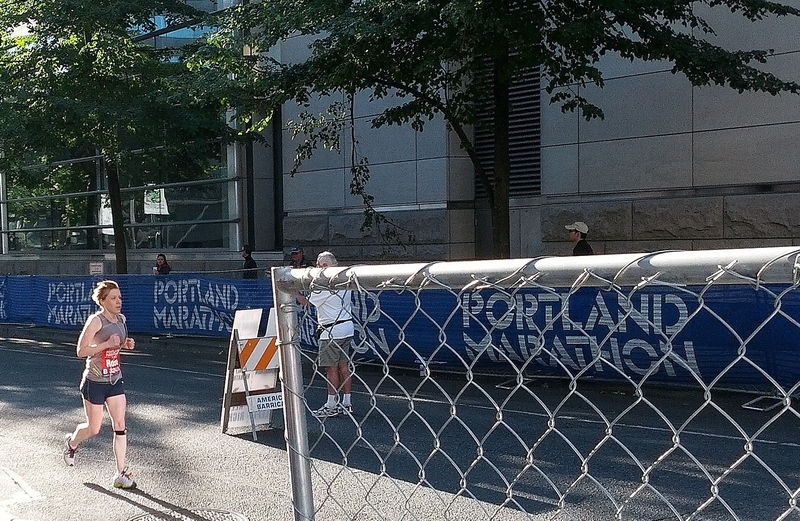 I had the opportunity for two firsts and decided to view that a challenge to take on. I had to start by considering my mushroom options. After some discussion, I was able to discern I would be best to avoid button mushrooms. A friend let me know that it was likely these types of mushrooms I had generally been served in restaurants and had spit out in slimy horror. This was helpful information. Button mushrooms were flagged as off limits for now. I was also gently steered away from Portobellos for the time being; it being suggested those might be best left for after developing a bit more mushroom tolerance. So I knew what to avoid. Excellent. Next, I needed to know what to make. I wanted to try something that would definitely feature a hefty dose of these little fungi, but would also have familiar and likeable components. I didn’t want to just dive right into a plate of cooked mushrooms with no other food around, if you know what I mean. I decided on Italian. Specifically, I decided on an Italian vegetable pie. 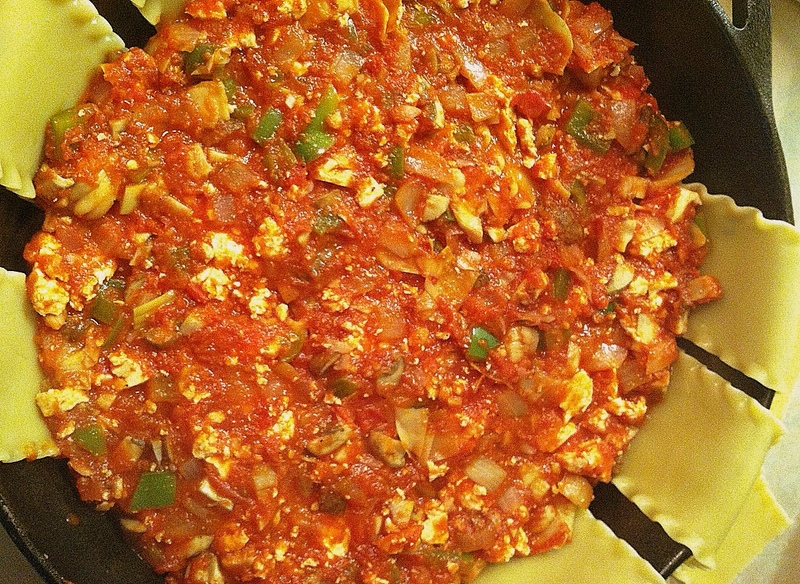 This vegetable pie would have many items I love (onions, tomato sauce, garlic, bell peppers) along with a hearty portion of mushrooms. Knowing what kind of mushrooms NOT to get helped guide me at the store and I settled upon a bag of crimini mushrooms to feature in my vegetable pie. 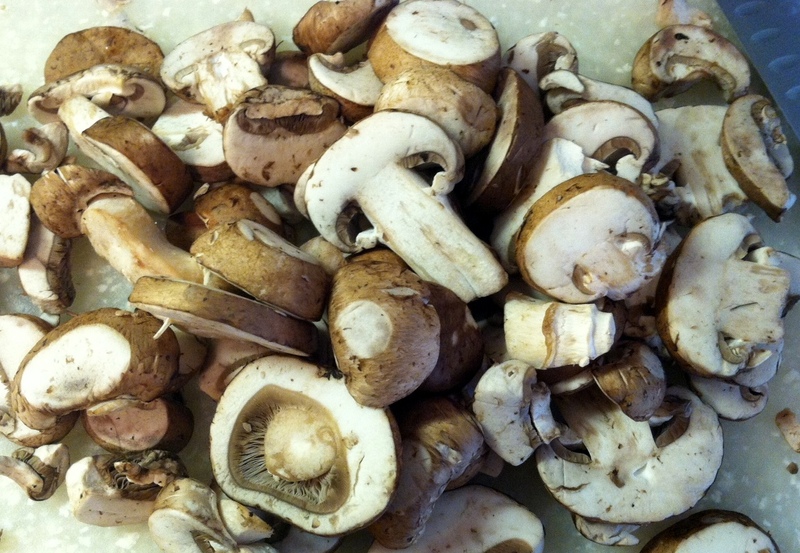 Italian mushrooms for Italian pie. Perfect. 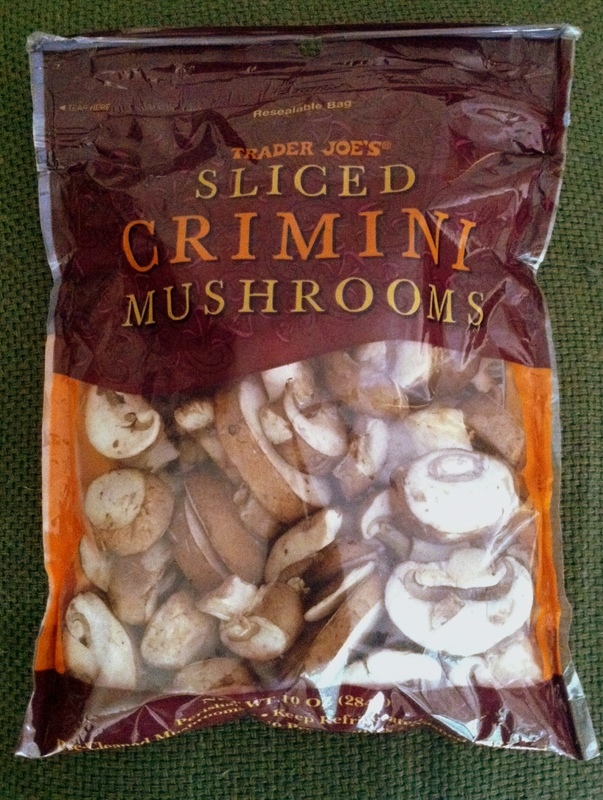 The criminis that I bought were pre-sliced (fancy), but I wanted them chopped a bit smaller, so I took care of that at home. I will say, as someone who finds chopping vegetables thoroughly pleasant and at times even therapeutic, going to work on these mushrooms was very enjoyable. The ease at which my chef’s knife moved through them was quite satisfying. The mushrooms were cooked briefly with other filling ingredients for the pie, layered up with the noodles and sauce, and baked for a short while. When the pie was ready, I was nervous. I wanted to love it. I wanted to love THEM. But I was totally unsure of how it was going to turn out. Slicing up the Italian pie, I dove in with gusto. I decided to just take a leap of faith in regards to this meal and tried to eat without the memory of past experiences coloring my tastebuds. It was GREAT. It was REALLY GREAT. This was a perfect re-introduction to mushrooms, as I certainly did know they were on my plate, but they held their texture quite well and I ate them in forkfuls with other familiar and delicious ingredients, not having to be the only thing I tasted in each bite. You may have noticed that I titled this post ‘Making Friends with Mushrooms – Part 1’. Because there are so many varieties of mushrooms, as well as an abundance of preparation options for them, I have decided I will do another post or two featuring the mushroom family. And, I’m actually looking forward to it, which is nice. 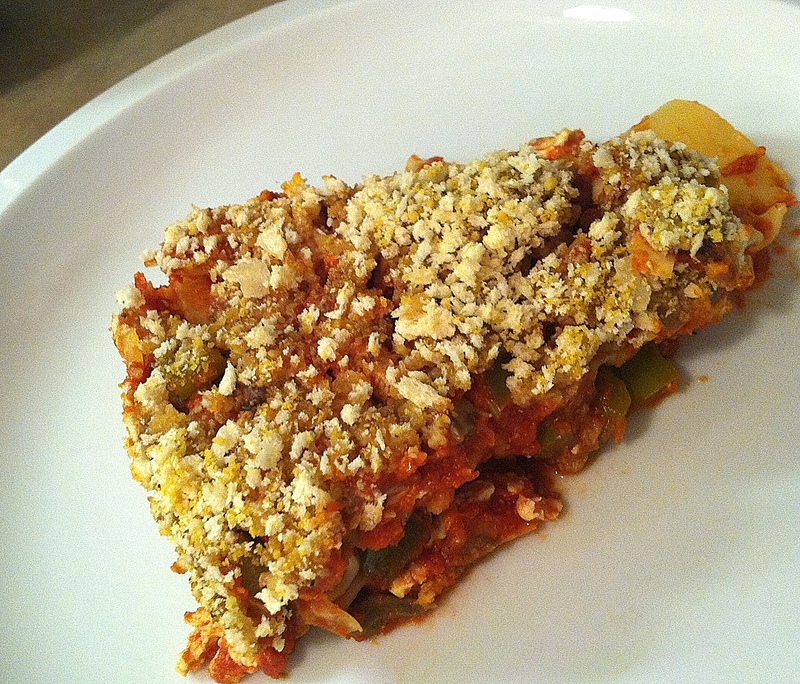 Serving Suggestions: I have to say the Italian Vegetable Pie I made was quite good. It hit all the right notes for those who love lasagna or Italian casseroles, but provided a new twist on these old favorites. The recipe is below if you, too, want to give it a try. It’s filling, produces an enticing aroma while it cooks, and makes a lovely presentation, in addition to just tasting really good. Lessons Learned: Be flexible and creative when trying to incorporate ingredients that may not initially appeal to you. Once I stopped my rigid thinking about mushrooms (ALL mushrooms are bad) and considered that maybe the types or preparations I had experienced in the past just weren’t the best ones for my particular tastes, I was able to think about this ingredient in new ways. Drawing upon positive food experiences as a base and finding ways to incorporate mushrooms into food I already knew I would enjoy has opened up new cooking doors for me. Boil lasagna noodles according to package directions, set aside when done, and preheat oven to 375 degrees. Coat a large non-stick skillet with cooking spray and place over medium heat. When warmed, add bell pepper, onion, and garlic. Cook, stirring frequently, 4-5 minutes until softened. Add mushrooms, artichoke hearts, and crumbled tofu. Stir to mix all ingredients and cook 3-4 more minutes. Add tomato paste, oregano, fennel, red pepper flakes, salt, and pepper, Stir to coat vegetables with seasonings and then add marinara sauce. Bring to a boil, reduce heat to low, and let simmer for 10 minutes, stirring occasionally. Remove from heat. In a small bowl, combine bread crumbs and vegan Parmesan and set aside. Coat a 9-10 inch pan or cast iron skillet with cooking spray. Arrange cooked lasagna noodles in a circular pattern around the pan, so that they line the bottom of the pan, with half of the noodles hanging over the edge. Spoon half of the vegetable-marinara mixture onto the noodles. Fold the hanging edges of the noodles over to cover this part of the filling, then spoon the rest of the vegetable-marinara mixture on top. 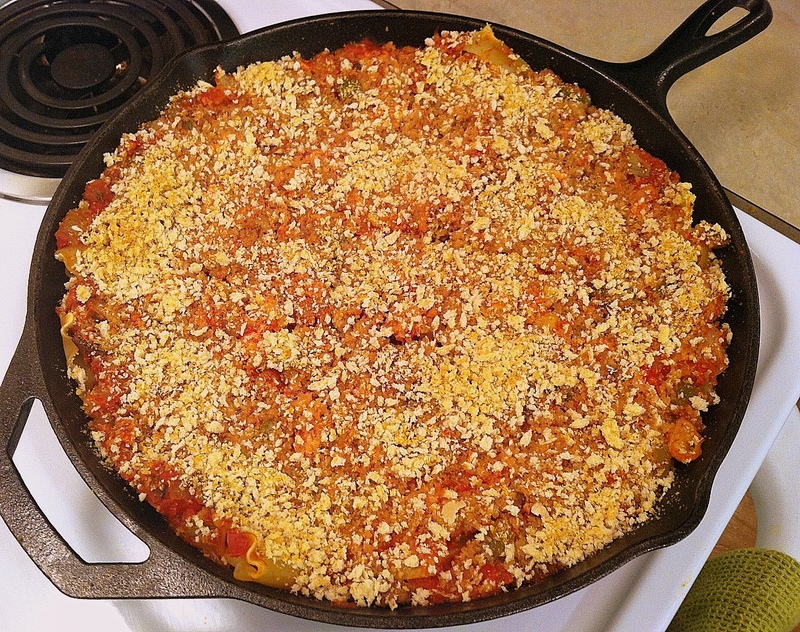 Sprinkle bread crumb and vegan Parmesan mixture evenly over the top. Bake for 20 minutes. What’s a Chunk of Energy, you ask? Excellent question. Until recently, I wasn’t sure either. Fortunately, I have been educated on the matter. 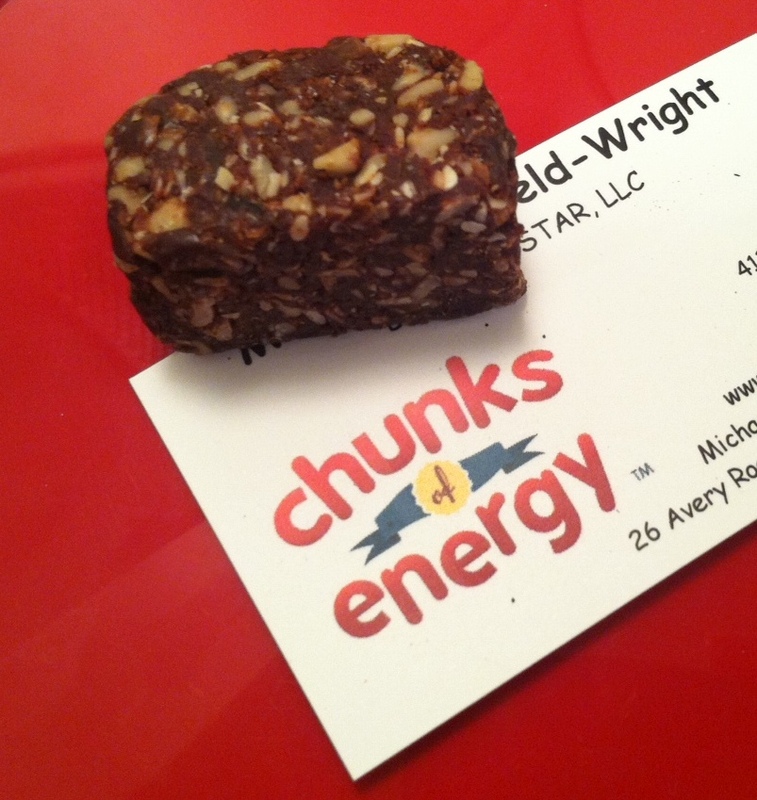 When I was contacted by the kind folks behind Chunks of Energy, I was intrigued and flattered. It turns out that the matriarch of this family business came across my blog and thought I sounded like someone who would enjoy these little bites. They offered to send me some samples to try and invited me to check out their website. What I found there was pretty exciting (for someone like me who gets excited over new, healthy eats). 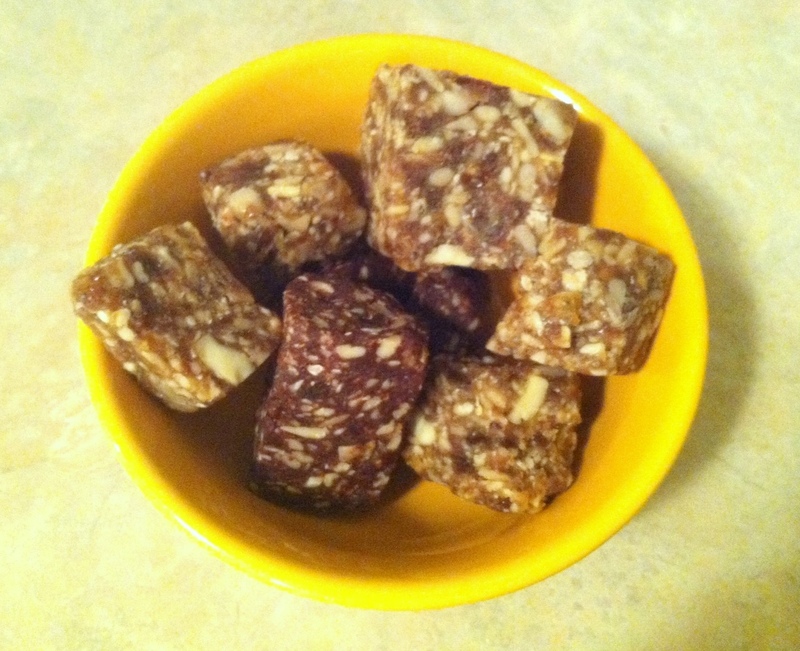 Chunks of Energy is a delightful company that produces tasty, raw, nutrient-packed bite sized snacks that are pretty darn fantastic for people on the go. They have a number of varieties, all of which are full of natural sweeteners designed to deliver a healthy energy boost. Personally, as a runner, I was so pleased to see ingredients that I know are great for providing me the fuel I need to log my mileage without sacrificing health. Dates. Chia. Goji Berries. Apricots. Seeds. I could go on, but I’ll let you look for yourself. Also making me happy is the fact that there are several options for people with specific dietary preferences. There are dairy-free, soy-free, vegan, gluten-free , and salt-free options. Cacao with Goji Berries – Like your energy with a bit of chocolate on the side? The cacao in this one can satisfy those who like a chocolaty flavor, for sure, but the addition of the goji berries turns this into a rich little treat. This one, in my opinion, could almost pass as a dessert-type bite. Hmm. Makes me want to crush some up over some non-dairy vanilla ice cream, actually. I will have to give that a try. Lemon Pomegranate – Wow; this one is refreshing! The citrus is bright, flavorful, and really feels like a bite of sunshine. It’s vegan, salt-free, and organic. I kind of want to enjoy a bite of this flavor alongside my breakfast. It makes a lovely way to brighten my morning and start the day! Date Flax with Turmeric – This was my favorite of the three. The sweetness of the date is countered with the earthiness of the turmeric, combining to make a nicely balanced and totally delectable snack. Plus, for me specifically, these are nutritionally fantastic. This combination is pretty much ideal for athletes, providing healthy natural fast-releasing energy (dates), healthy fats and oils to lubricate muscles and joints (flax), and inflammation fighting powers (turmeric). Perfect. Curious to learn more about Chunk of Energy? The kind folks behind the delicious products invite you to make contact at the Chunks of Energy site (www.chunksofenergy.com), and/or on facebook (www.facebook.com/chunksofenergy), twitter (www.twitter.com/ilovechunks), and pinterest (www.pinterest.com/chunksofenergy). Disclaimer/Note: While the Chunks of Energy that I taste-tested were provided to me by the company, I was not compensated for this review and the opinions I express here are totally and completely my own. I was not obligated to write a review, but chose to do so because I was so legitimately impressed with the products. For a long while, I associated Cajun food with the sea. Fish, crustaceans, and other sea creatures always seemed to be involved in any Cajun meal. Even before I was a vegetarian, I didn’t care for seafood, so Cajun cuisine was something I long avoided. Something else I shyed away from was cornbread. Despite my affinity for carbs and bread products in general, most cornbreads I had sampled were sweet – the kind with lots of added sugar or honey and that wasn’t for me. 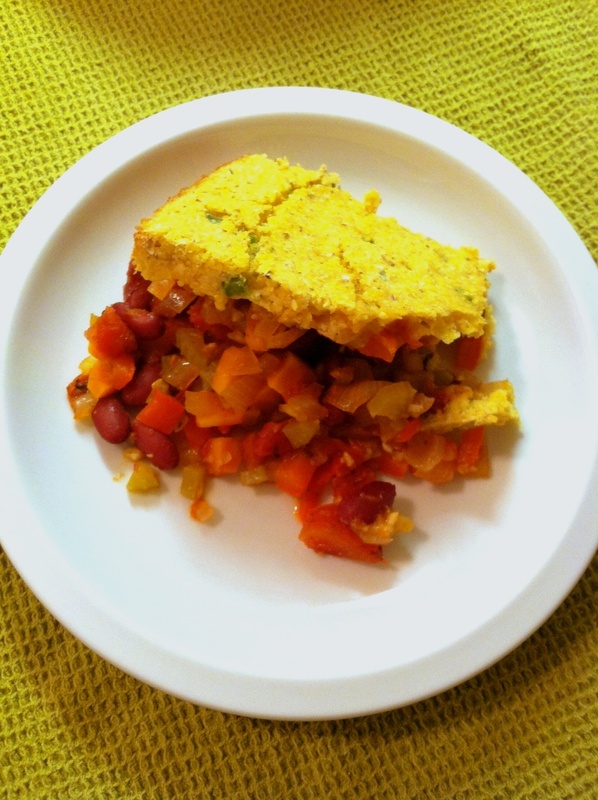 For these reasons, when I came across a recipe for a Cajun casserole with a cornbread topping in my Everyday Happy Herbivore cookbook, I was excited at the prospect of trying a Cajun dish and I figured I could tweak the cornbread topping to ensure it was a slightly spicy, not sweet, rendition that would suit my tastes. 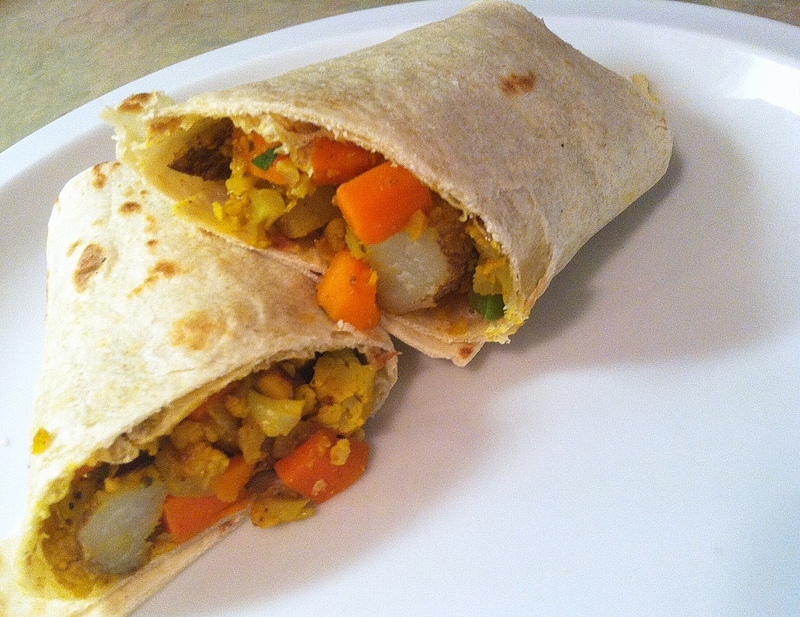 I did make a few changes to the original recipe and was more than pleased with the results. First, let’s take a look at the main part of this dish which is comprised of fairly traditional Cajun flavors. You’ve got your feature players: beans, tomatoes, bell peppers, and carrots. All good stuff. All good stuff that is then brought together happily with a flavorful seasoning blend and lots of garlic. This on its own would make for a delicious meal, but it gets even better. Because then, you see, comes the cornbread topping. As someone who dismissed cornbread for years, it’s funny now how I’ve come to crave it. I will at times make or request a whole meal solely because it is something that would be served nicely alongside cornbread. 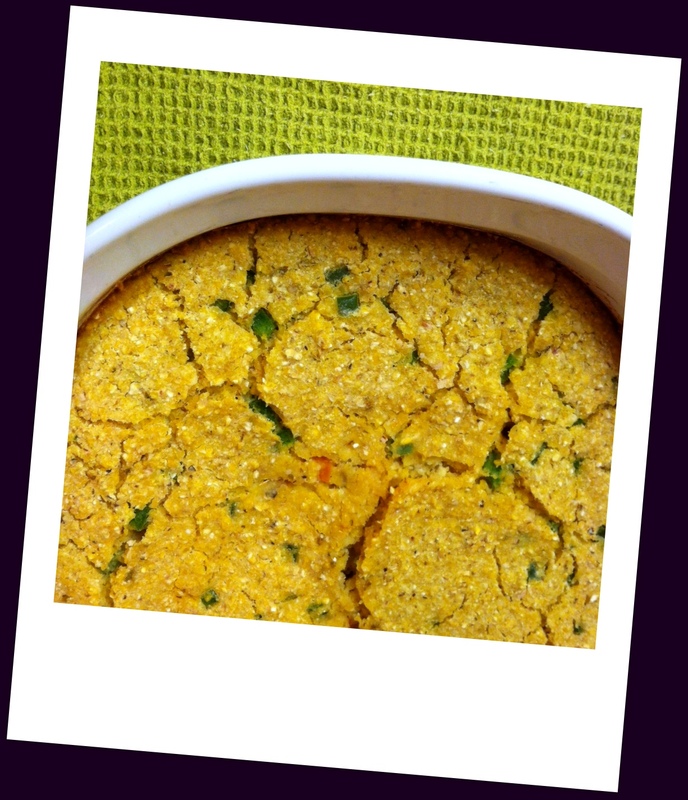 The thing that really excites me about this cornbread is that I wasn’t sure if a quality cornbread topping could be made that was tasty, satisfying, still relatively nutritious, and low in fat, but it was! I’m sure that you can imagine how pleased I was to discover that this is indeed possible. Here is the final product. I present to you a truly hearty dish that oozes the flavors of the south and, served alongside a nice salad, provides a well-balanced, complete meal. Preheat oven to 400 degrees. Coat a 3 quart casserole dish with cooking spray. Heat oil in a skilled over medium-high heat. Add onion, celery, carrot, and bell pepper and sauté until vegetables are softened, about 5 minutes. Add garlic and sauté about 1-2 minutes longer. Mix in drained tomatoes, Cajun seasoning blend, and drained kidney beans. Stir to combine well. Pour base into the casserole dish. 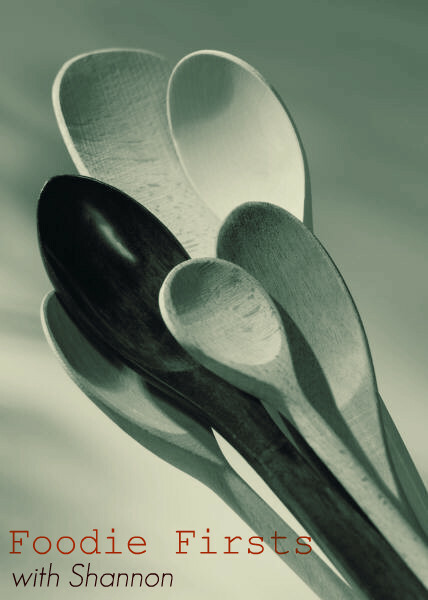 Using a spatula or spoon, spread evenly and pat it down, so it is even and compact. 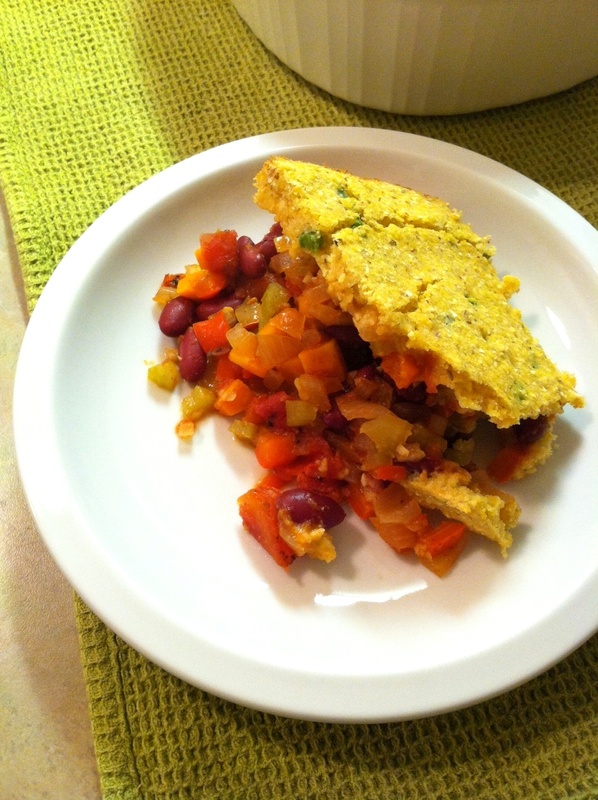 Set aside while you prepare the cornbread topping mixture. Whisk together cornmeal, baking powder, salt, oregano, and sugar. Add almond milk and applesauce. Stir to combine. Then, toss in the diced jalapeno pieces and gently stir to distribute throughout the batter. Pour cornbread batter on top of the base layer and spread evenly. Bake for approximately 30 minutes, or until the cornbread topping is golden and beginning to crack. Remove from oven and let sit at room temperature for about 10 minutes before serving. Serve with hot sauce, if desired. Here’s the deal. I have no doubt that training partners work wonders for some people. I’m sure they really do provide a sense of accountability, fun, and motivation for some people. But, it’s not for everyone. It’s not for me. 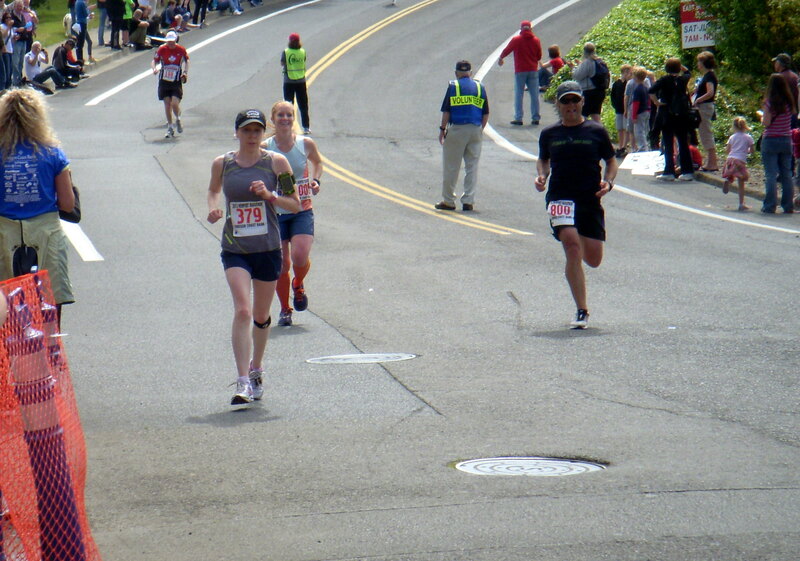 When I set out to drop some excess weight, develop my fitness level, and eventually become a runner, I knew that the only way I was going to be successful was to do it alone. In the past, when I had made similar attempts, I told people about them. I followed the advice given in articles that in order to be accountable, I needed to announce my intentions to others. The idea is that others could encourage me and help me follow through. But, what really happened, was that I became so conscious of the expectations that others then had of me that I failed completely. My goals turned into their goals in my head. Even if they weren’t applying pressure to me, I applied it for them. If I ate a big piece of cake, I thought, “Oh god, [insert name here] would be so disappointed in me right now.” If I skipped a workout, I would feel embarrassed and like I had let someone down. Eventually, I would crack from the pressure and just give it all up, because the idea of continuing to break the commitments that I made to others, to publicly fail at my goals was too much for me. Essentially, what should have been a personal journey and process turned into anything but personal. I truly believe that a key factor in making sustainable, permanent changes in my life over the last two years has been to keep quiet about it. Two years ago (this month marks two years since I began), I set out on some simple goals. First, I would start to eat healthier. I would learn more about nutrition and would incorporate changes into my daily diet. I would cook more. I would eat less junk. Then, after a bit, I would start to be more active. Some time dedicated to walking and short fitness videos has turned into me now training for my first marathon, strength training a few hours a week, and being in the best shape of my life. And, I did it quietly. I told only two people about what I was going to do. I told my partner and our roommate. They had to know, because quite frankly, there wasn’t any way around it. I live with them, so they would see what I was doing. But, other than them, I didn’t tell a soul. I just started doing. What this meant was that my goals were solely my own. No one else was telling me what I should do, shouldn’t do, or what they did that worked/didn’t work. My successes were solely were my own – allowing me to truly feel accomplished and own the progress I was making. And, my failures were my own, too. When I ‘messed up’, it was my choice and my mess to clean up. I didn’t let anyone else down, other than myself. That was liberating. Of course, over time other people saw changes and asked about them. And, I would answer. I didn’t lie or cover things up, but I answered questions simply and didn’t engage in extended dialogue about it all. Now, two years later, I can talk about it all more openly because my entire way of living has truly changed and the things I’m doing now are part of my daily life, as ingrained in my routine as sleep and going to work each day. But, in the beginning, being able to keep it to myself was crucial in my success. Maybe it’s because I’m an introvert by nature. Maybe it’s because I’m always thinking about how to accommodate the needs of others over my own. Maybe it’s because I’m sensitive to critiques after years of enduring them. I don’t know exactly why it was so crucial for me to make lifestyle changes privately, but it was, and I’ve got to figure that if it was for me, it may be for others, too. So, while the buddy system certainly has its benefits for many people, it’s not the answer for everyone. I suppose that my underlying point here is that what works for one, doesn’t work for all, and to have the courage to do things your way (even if it’s not the popular way) can make all the difference in the world. 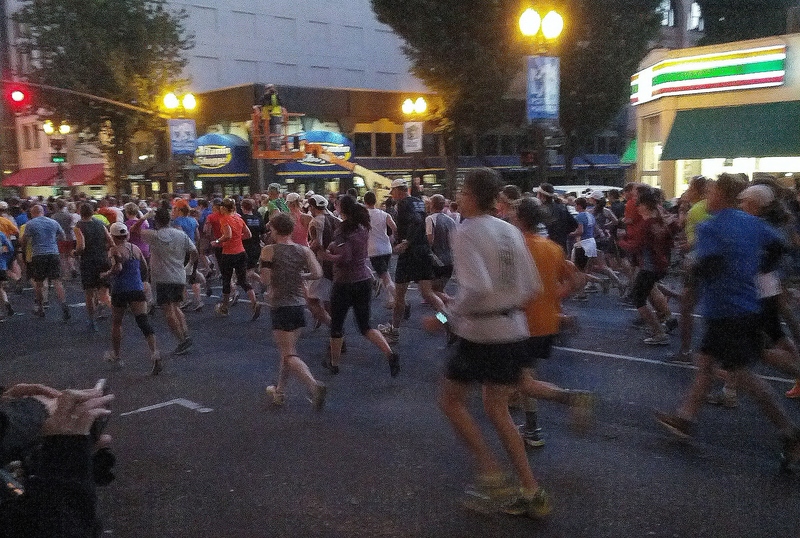 Why I Run – For My Health, Silly!